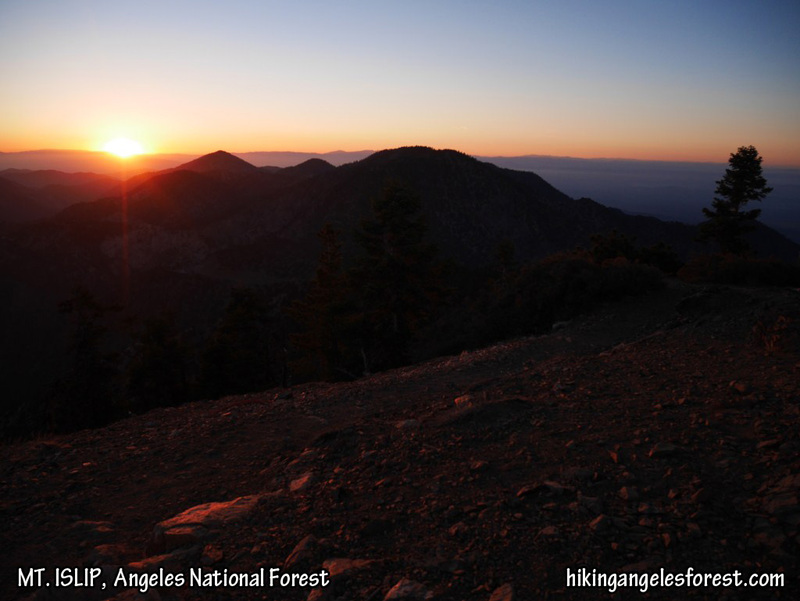 Miles hiked in 2014: 430.1 with 106,377′ gain. 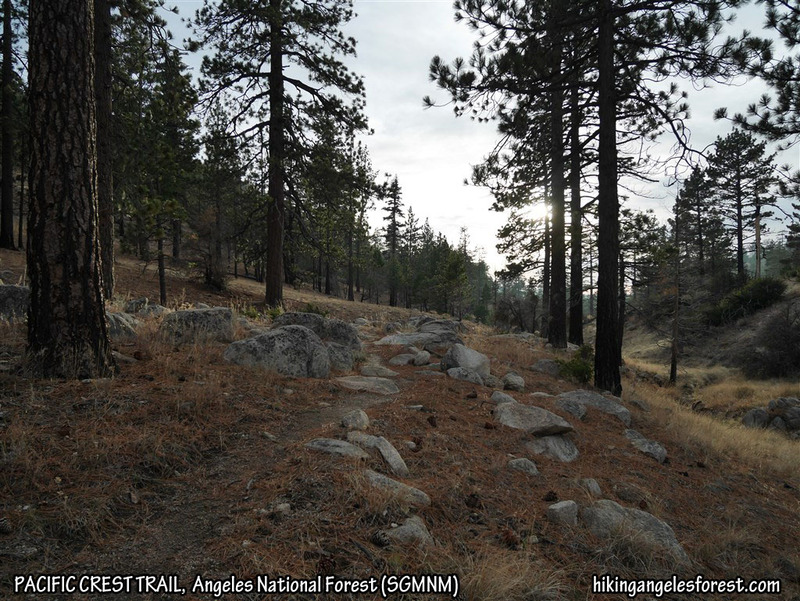 Miles hiked in Angeles Forest in 2014: 374.8 with 98,782′ gain. View looking toward Mt. Waterman from the un-named peak at UTM 113016. Hike #059 on December 26. 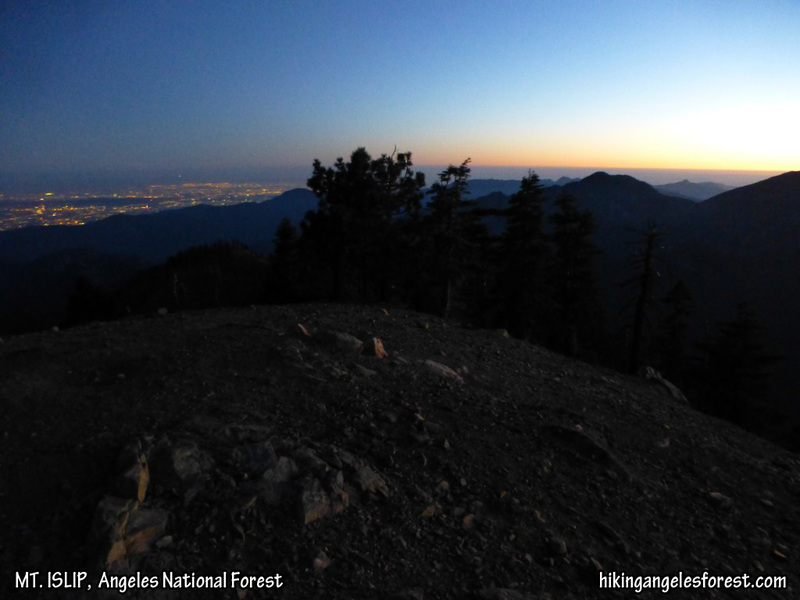 Solo hike largely x-country from the PCT at mile marker 54.10, partly along an old un-maintained dirt road and then a scramble to an un-named ridge to an un-named peak described in 106 Tops in Angeles Forest pg. 120. Stats: 3 miles, 665′ gain and loss. Hike #058 on December 14. I snowshoed the Mt. 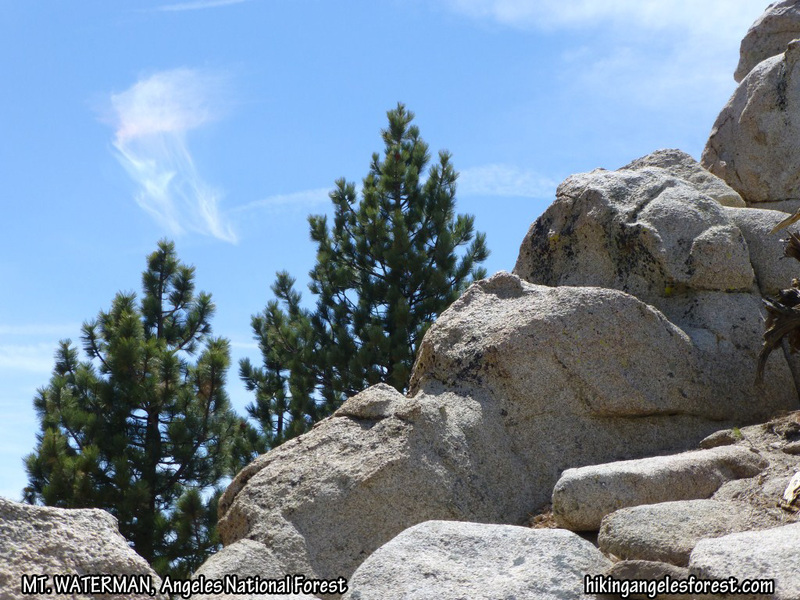 Waterman Trail to Mt. Waterman with Etienne (part way). Stats: 6 miles, 1250′ gain. Hike #057 on December 7. 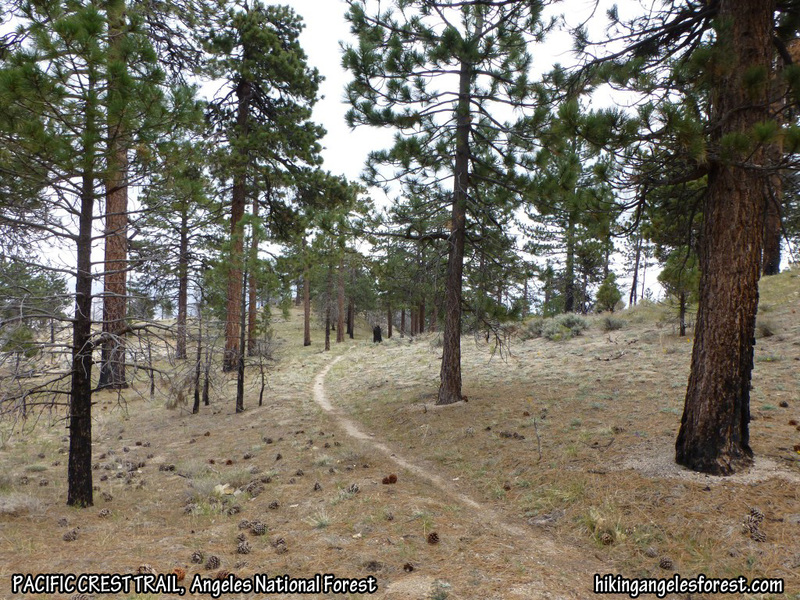 Solo hike along the Pacific Crest Trail (a.k.a. 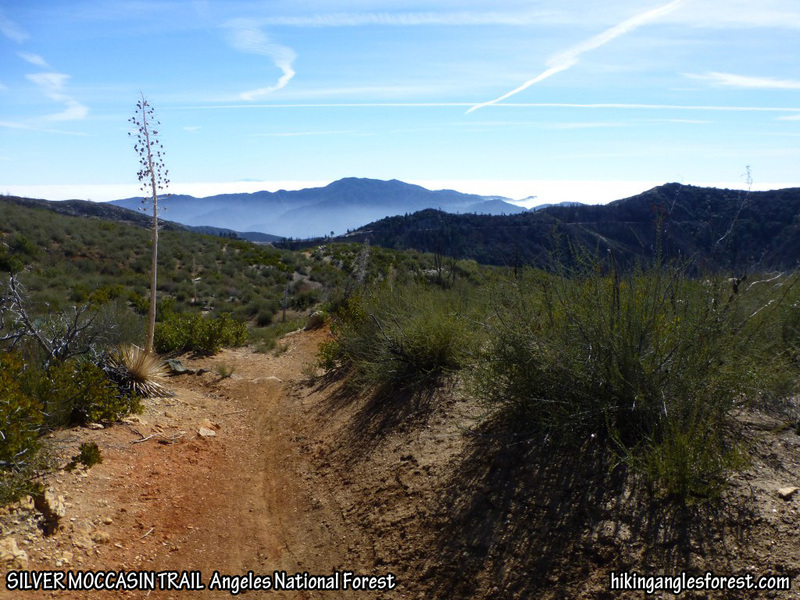 Silver Moccasin Trail) between Three Points and Cloudburst Summit and then up to Winston Peak. Stats: 11.4 miles, 1977′ gain. View toward north face of Strawberry Peak from Strawberry Meadow. #056 on December 6. Solo Hike from Red Box to Strawberry Meadown (at the end of the meadow when the trail turns north and heads up). Stats: 9 miles, 1500′ gain. View toward Mt. Deception, Mt. 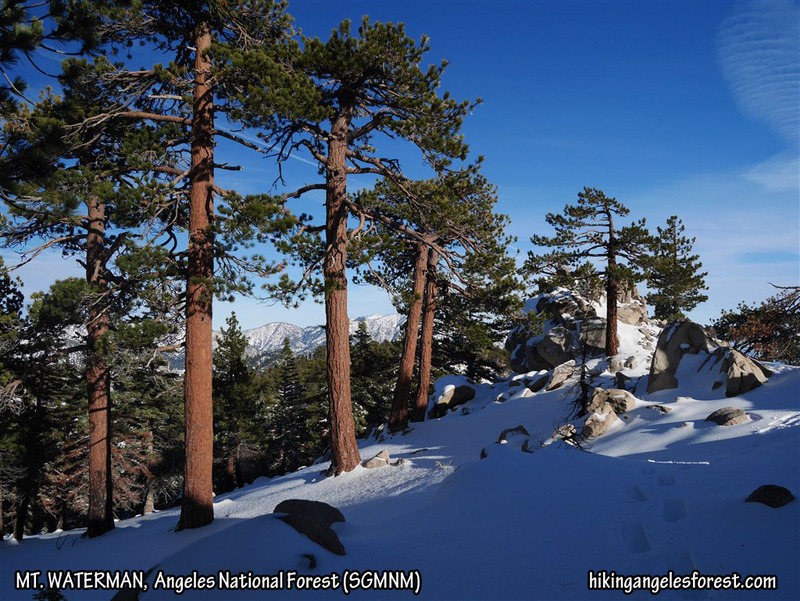 Disappointment, San Gabriel Peak, Mt. Markham, and Mt. Lowe from Brown Mountain. #055 on November 21. Solo hike from Eaton Saddle to Brown Mountain. Stats: 8.2 miles, 2180′ gain. View of the final approach leading to Strawberry Peak. #054 on November 16. Hiked from Red Box to Strawberry Peak with Etienne. Stats: 7 miles, 1845′ gain. View looking toward Twin Peaks from the Mt. Hillyer Trail. Hike #053 on November 14. 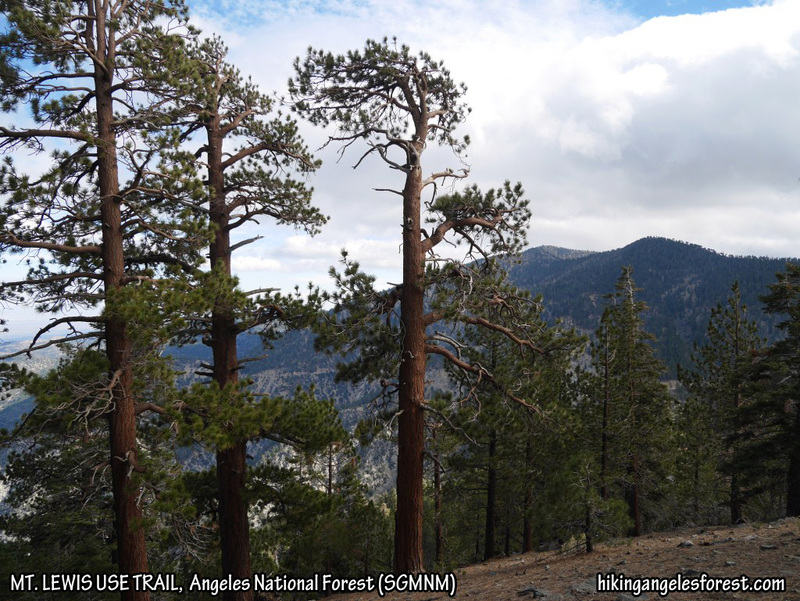 Solo hike of the Silver Moccasin Trail from Little Pines Loop to the Mt. Hillyer Trail to Mt. Hillyer. Stats: 8.2 miles, 1265′ gain. View of the Wally Waldron Tree just below Mt. Baden-Powell. Looking toward Mt. Burnham and Mt. Baden-Powell from the Mt. Lewis Use Trail. Hike #051 on October 25. Solo hike to Mt. Lewis and Throop Peak. Stats: 5.2 miles, 1728′ gain. Post: Mt. Lewis Is A Small Treasure Hidden In Plain Sight. Hike #050 on October 9. Solo hike from Cloudburst Summit Trailhead, South Use Trail up to Winston Peak. 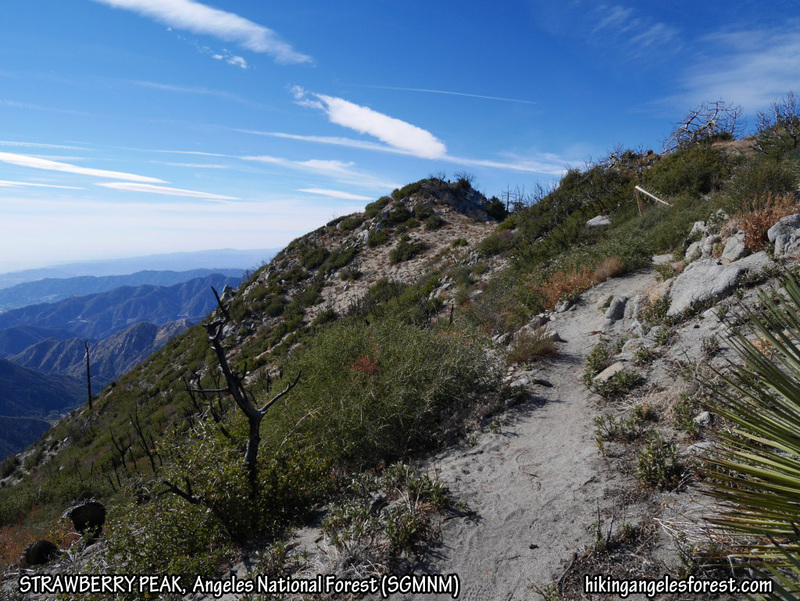 From Winston Peak, North Use Trail down to Pacific Crest Trail and around Bump 6903 via the South Use Trail and then follow Winston Ridge Use Trail to Winston Ridge and about .1 miles beyond to rock outcrop round trip. 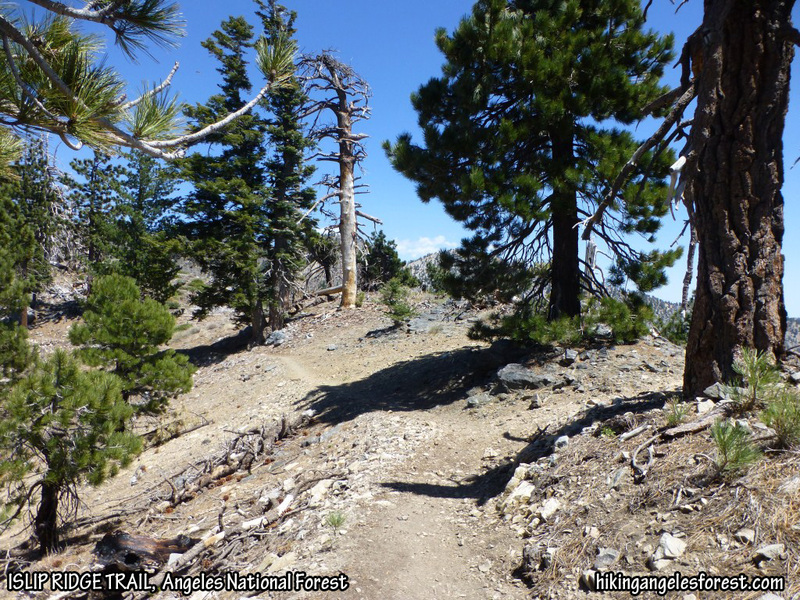 Come back using the North Use Trail to get around Bump 6903 and take the Pacific Crest Trail back to Cloudburst Summit. Stats: 5 miles, 1545′ gain. Hike #049 on August 29. 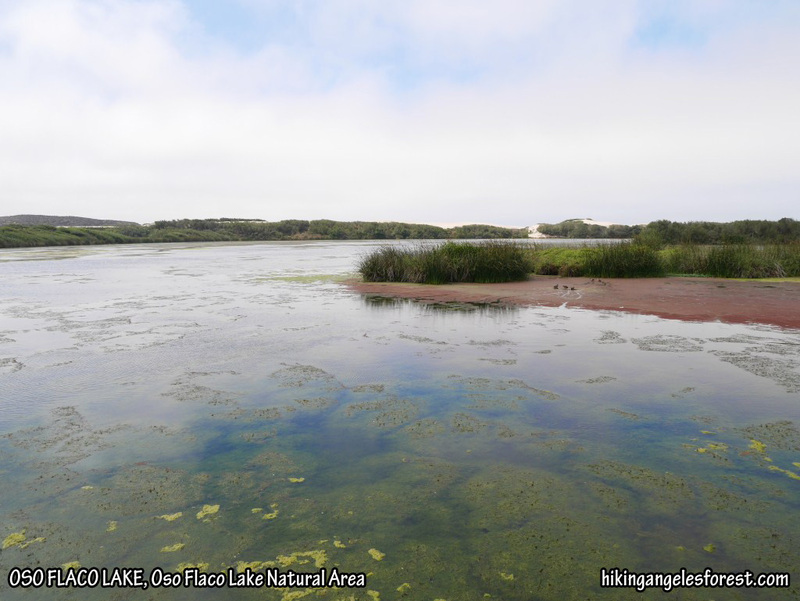 Oso Flaco Lake Trail with an extension to Oso Flaco Creek at the beach with Debbie. Stats: 2.4 miles, 25′ gain. 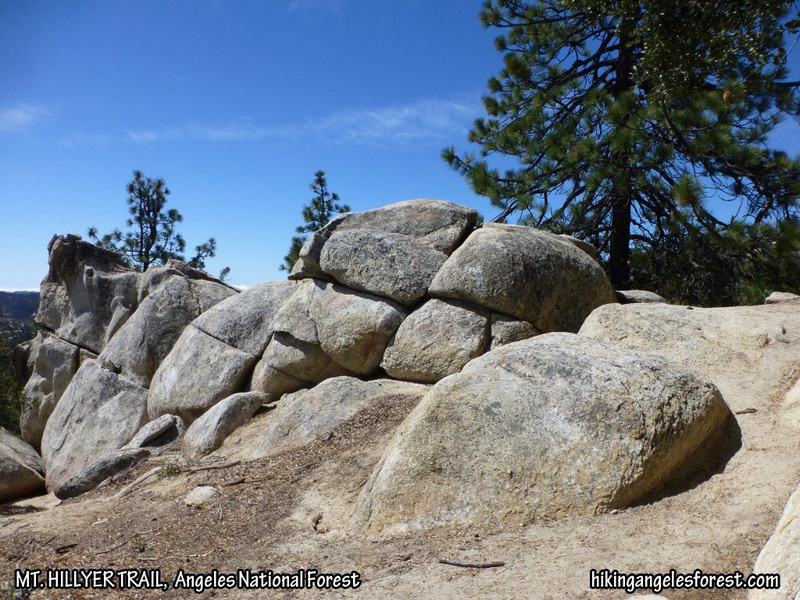 (Hike #98 in Stone 2009). 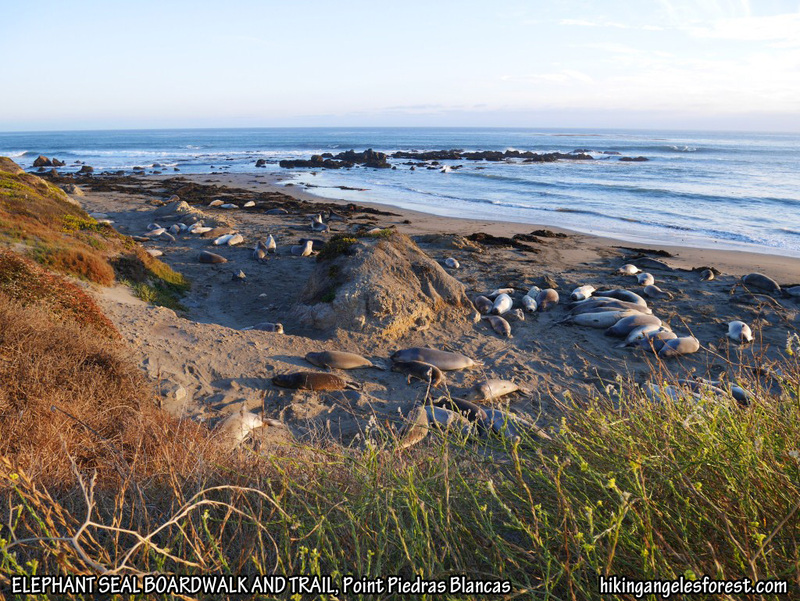 Elephant Seal Boardwalk and Trail, Point Piedras Blancas off Highway 1. Hike #048 on August 28. Elephant Seal Boardwalk and Trail off Highway 1 at Point Piedras Blancas (north of Hearst Castle) with Debbie. Stats: 0.5 miles, 30′ gain. 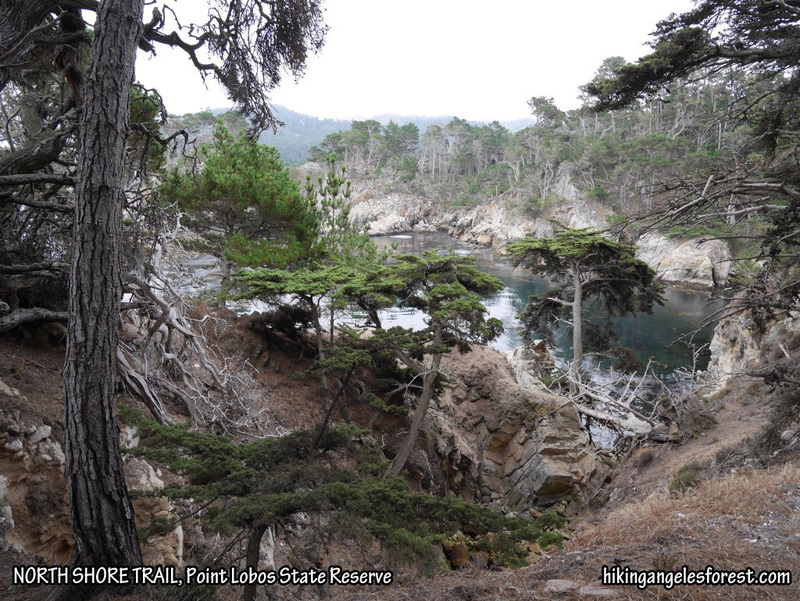 North Shore Trail, Point Lobos State Reserve. Hike #047 on August 28. Loop crossing some or all of the South Shore, Lace Lichen, Carmelo Meadow, Granite Point, North Shore, and Sand Hill Trails with lunch at Whaler’s Cove with Debbie. Stats: 2.6 miles, 270′ gain. (part of hikes #3, #5, #6, and #7 in Stone 2003). 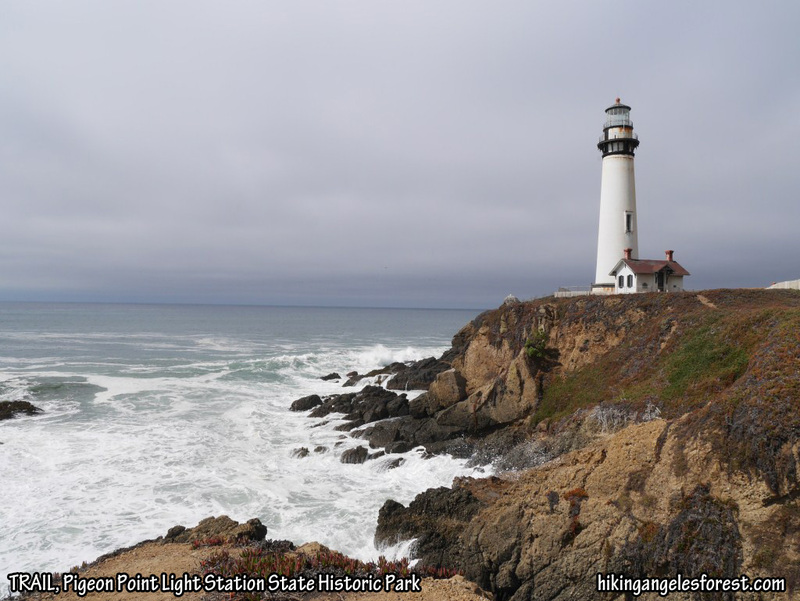 View toward Pigeon Point Lighthouse. Hike #046 on August 28. 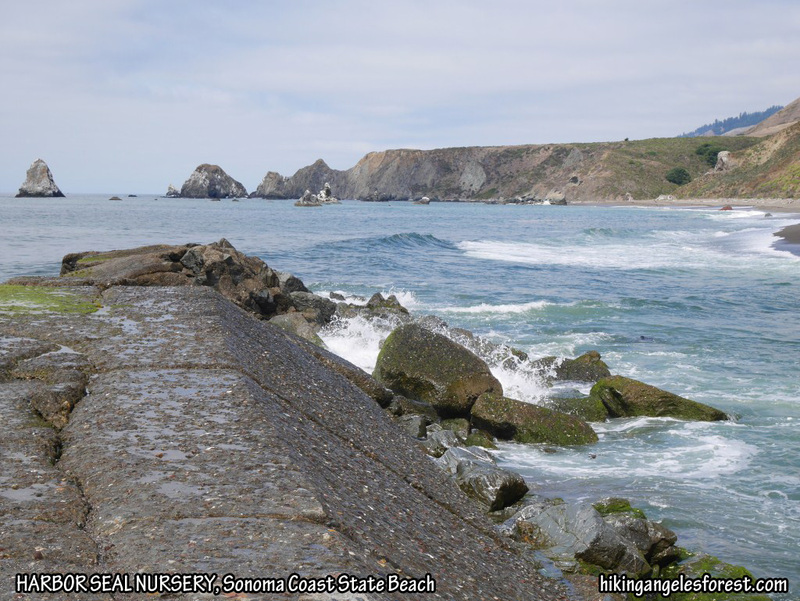 Pigeon Point Light Station grounds and beach around Prisoner Rock with Debbie. Stats: .5 miles, 20′ gain. 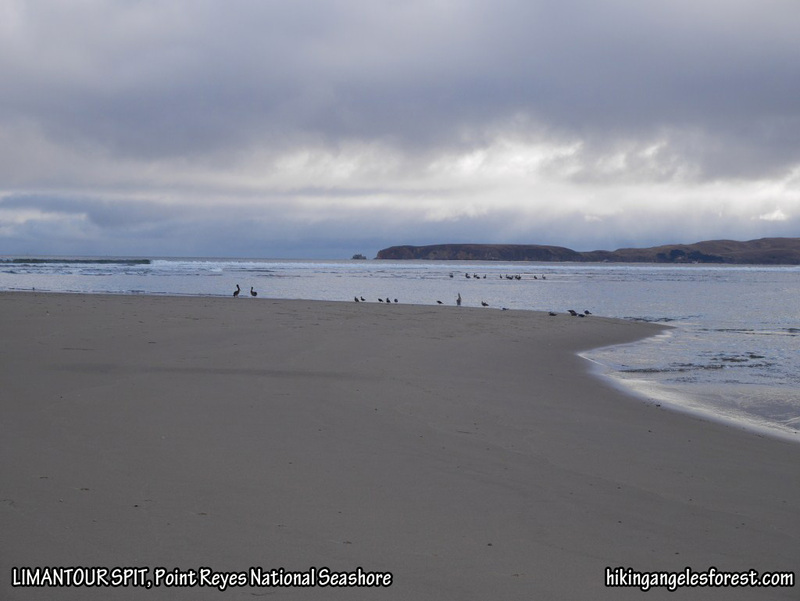 View from the end of Limantour Spit looking toward Drake’s Bay. Hike #045 on August 25. 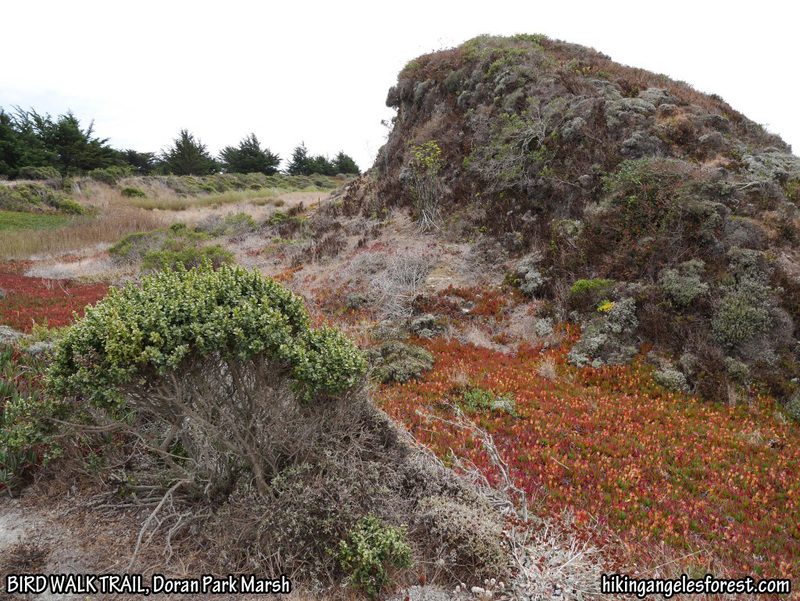 Limantour Spit Trail (including beach walk to the end of the spit) with Debbie. Stats: 5.6 miles, 80′ gain. (Hike #G9, Martin and Martin 2006). View from Chimney Rock, Point Reyes National Seashore. Hike #044 on August 25. Chimney Rock Trail with Debbie. Stats: 1.8 miles, 100′ gain. (Hike #G13, Martin and Martin 2006). View toward Creamery Bay, Point Reyes National Seashore. Hike #043 on August 25. 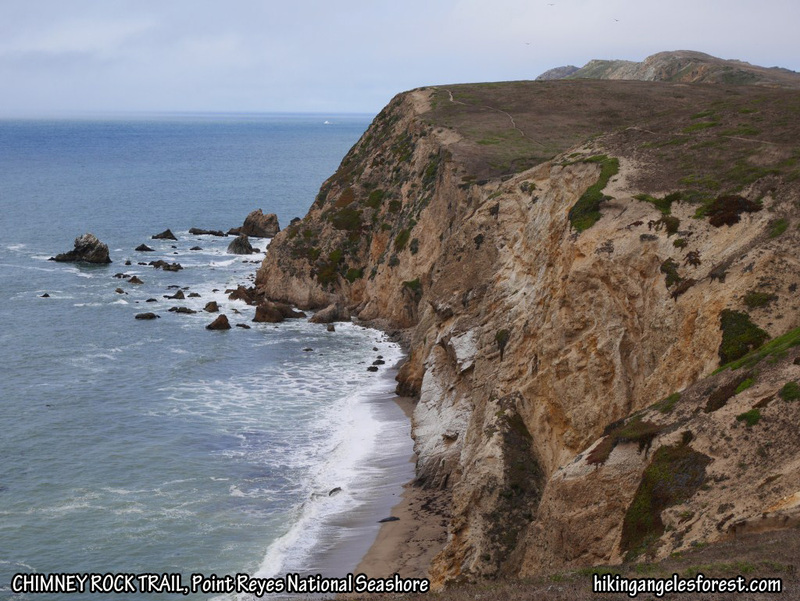 Partial hike of Bull Point Trail at Point Reyes National Seashore. Inadvertently got on wrong side of Creamery Bay and decided not to continue after returning to the point of making our wrong turn with Debbie. Stats: 2.5 miles, 100′ gain. (Hike #H11, Martin and Martin 2006). 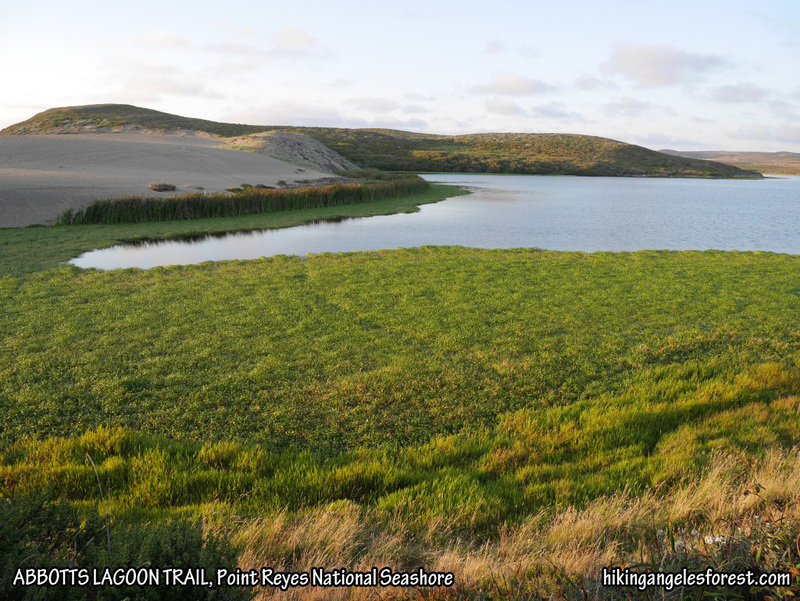 View towards Abbotts Lagoon, Point Reyes National Seashore. Hike #042 on August 24. 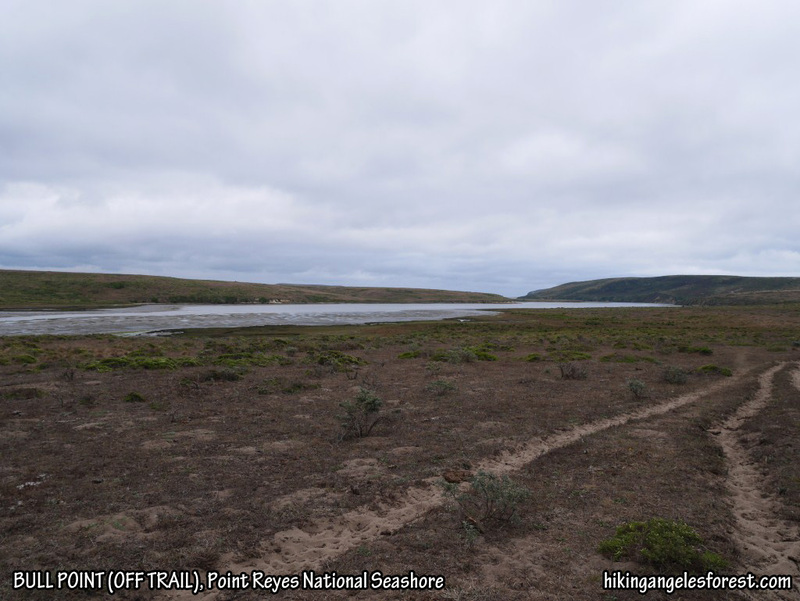 Abbotts Lagoon plus about .1 miles toward the beach at Point Reyes National Sea Shore with Debbie. Stats: 2.4 miles, 80′ gain. (Hike #G16, Martin and Martin 2006). Bird Walk Trail, Doran Park Marsh. Hike #041 on August 24. Bird Walk Trail and Cheney Bridge Trail extension at Doran Park Marsh with Debbie. Stats: 1.15 miles, 25′ gain. (Hike #36, Stone: 2007). 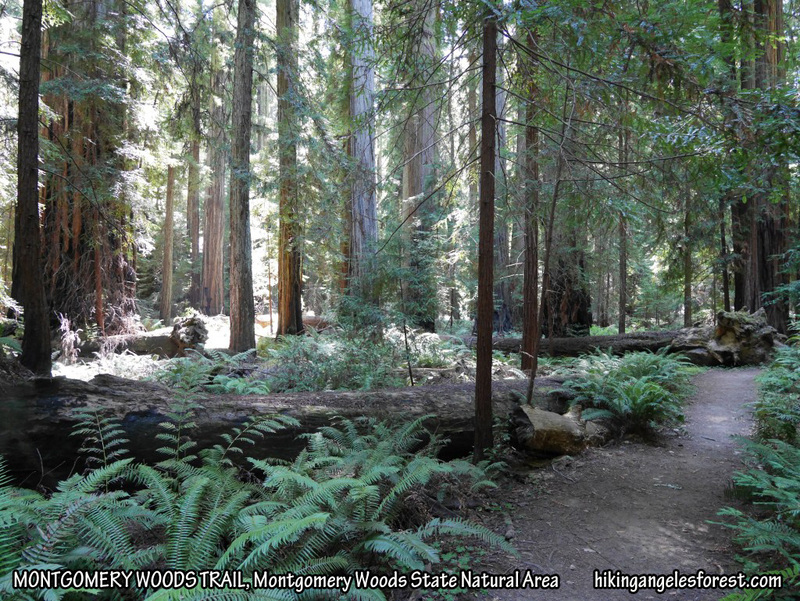 Montgomery Woods Trail, Montgomery Woods State Natural Area. 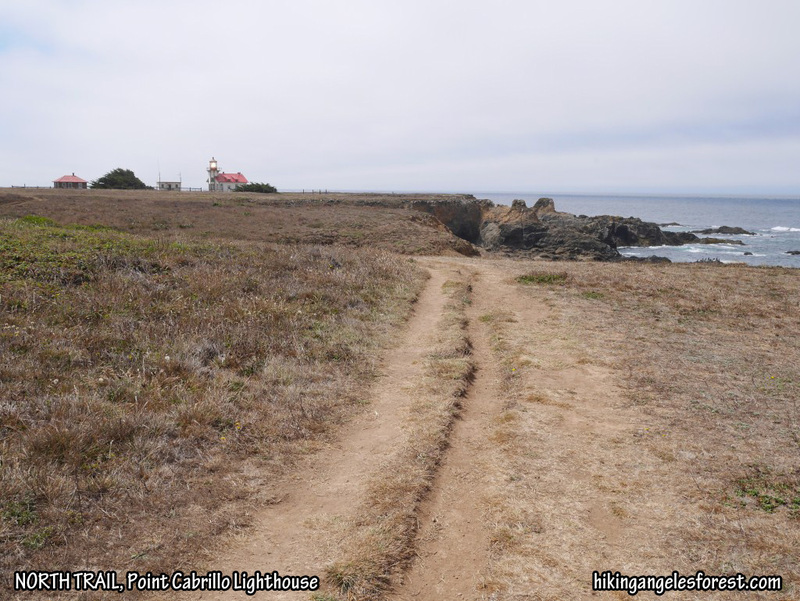 View toward Point Cabrillo Lighthouse from the North Trail. Hike #036 on August 21. 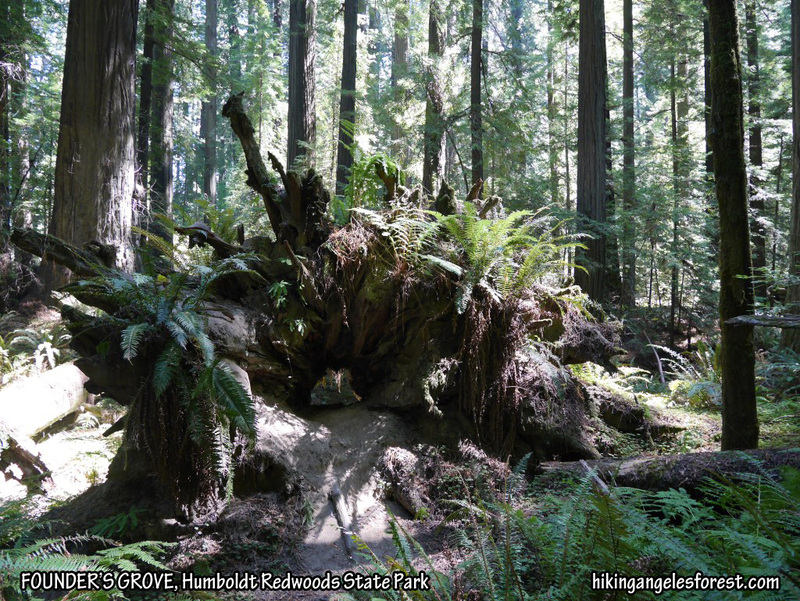 Founder’s Grove and Mahan Loop Trail in Humboldt Redwoods State Park with Debbie. Stats: 1.3 miles, 20′ gain. (Trail #19, White 2014). Hike #035 on August 20. 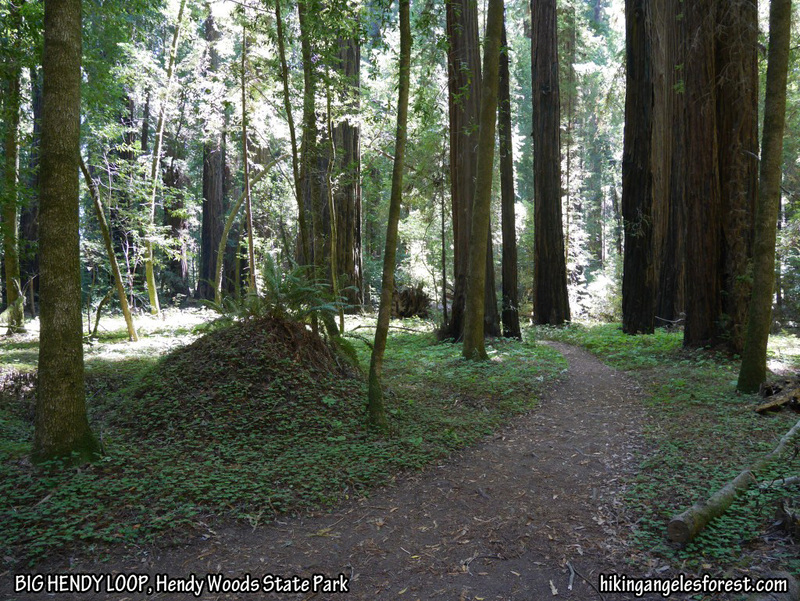 Solo hike of the Emerald Ridge Loop–including hiking along Redwood Creek, Tall Trees Grove, and the Tall Trees Trail–in Redwood National Forest. Stats: 5.2 miles, 700′ gain. (Trail #36, White 2014). Post: Combination Lock Access To Towering Redwoods. 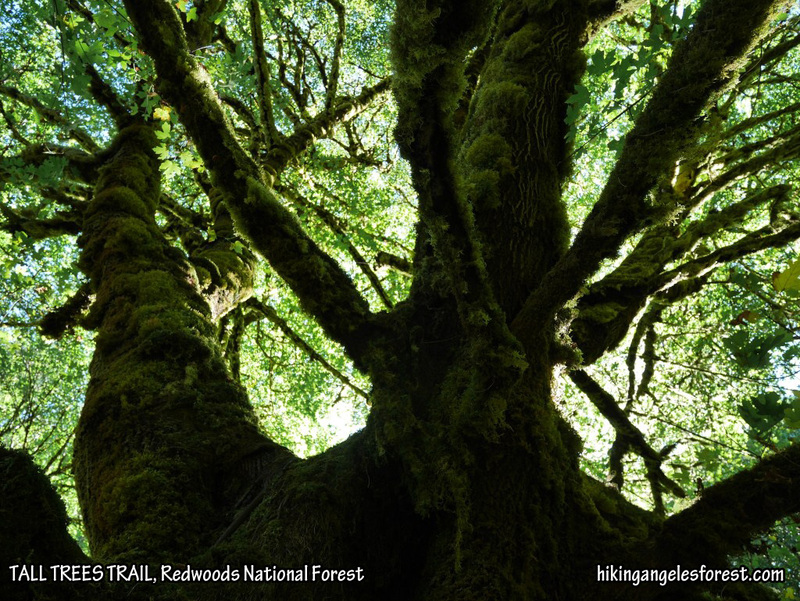 Photos: Emerald Ridge Trail, Redwood Creek, Tall Trees Grove and Trail. Pleasant View Ridge between Pallett Mountain and Burhart Saddle. Hike #034 on June 29. Day two of backpacking trip. I hiked from Pallett Mountain to Buckhorn Campground with Etienne. Stats: 5.6 miles, 1130′ gain, 2420′ loss. Hike #033 on June 28. Day one of backpacking trip. I hiked from Islip Saddle to Pallett Mountain with Etienne. Stats: 4.5 miles, 2484′ gain, 1394′ loss. View toward south from Middle Mt. Hawkins. Hike #032 on June 23. Day two of backpacking trip. We hiked from Little Jimmy to the South Saddle of Middle Mt. Hawkins, took the ridge to the summit, followed the use trail on the north ridge back to the Hawkins Ridge Trail and went back to Little Jimmy to pack up our tents etc, and finally went back down to Islip Saddle. Stats: 7.7 Miles, 1,655′ gain, 2,435′ loss. Hike #031 on June 22. Day one of backpacking trip. I hiked to Little Jimmy with Etienne and Lorenzo and set up camp. We then hiked up to Mt. Islip to watch the sunset. We hiked back down to Little Jimmy via headlamp. Stats: 4.5 miles, 1580′ gain, 800′ loss. 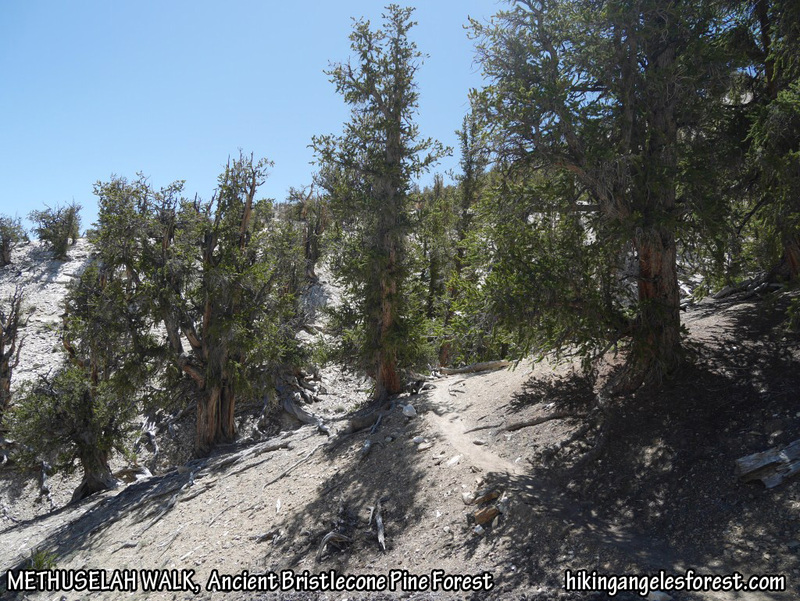 Methuselah Walk, Ancient Bristlecone Pine Forest. Hike #029 on June 12. Burkhart Trail to Pallett Mountain with Tim. Stats: 11.6 miles, 3,550′ gain. 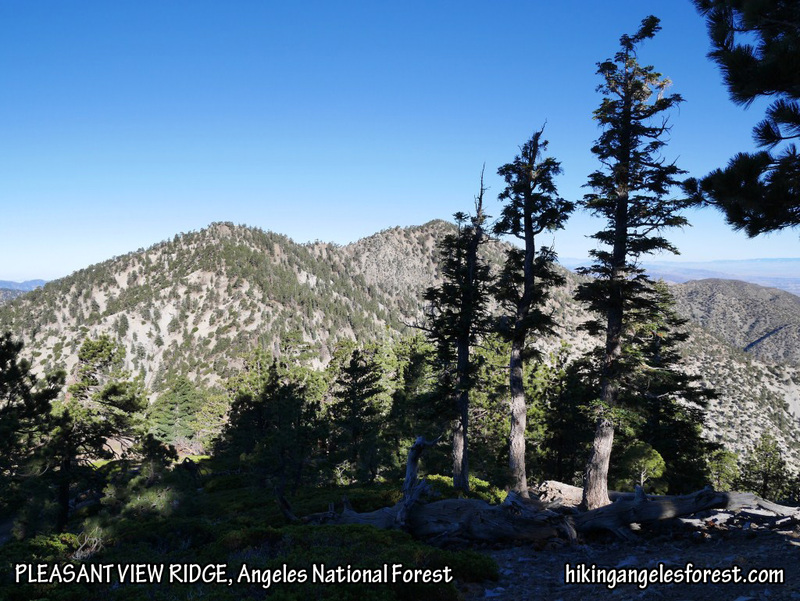 Pleasant View Ridge between the Pacific Crest Trail and Mt. Williamson. Hike #028 on June 7. 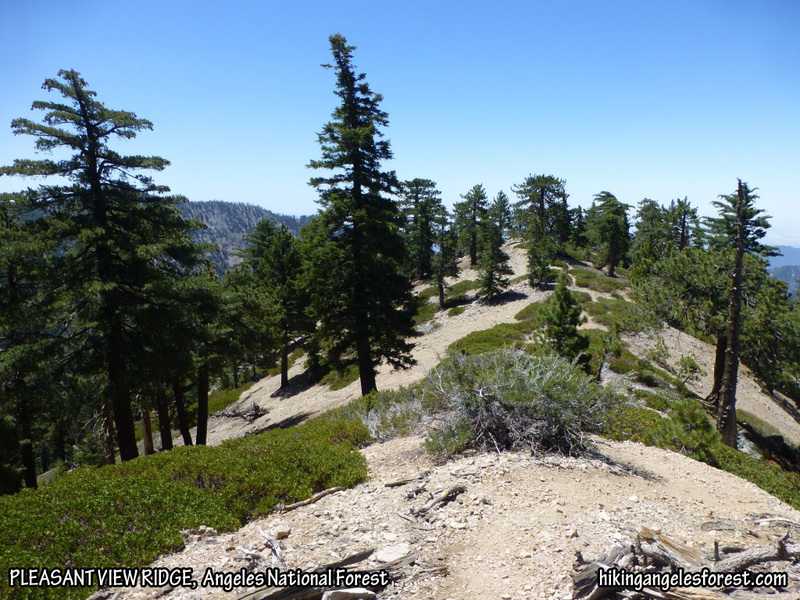 The Pacific Crest Trail to Pleasant View Ridge to all three bumps on Mt. Williamson with Etienne. Stats: 5 miles, 1800′ gain. Islip Ridge Trail between Mt. Islip and Windy Gap. Hike #025 on May 25. Pacific Crest Trail from Islip Saddle to Windy Gap, Islip Ridge Trail to Mt. Islip, Mt. Islip Trail to Little Jimmy, Pacific Crest Trail to Islip Saddle with Tim and Lorenzo. Stats: 6.6 miles, 1,890′ gain. Hike #024 on May 4. Mt. Waterman Trail to the summit with Etienne, Lorenzo, and Tim. Stats: 6 miles, 1,250′ gain. 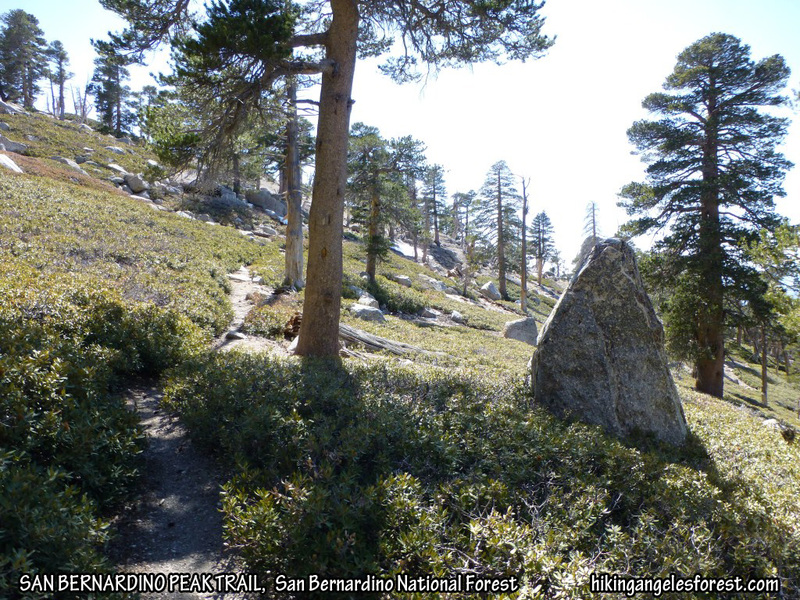 San Bernardino Peak Trail between Limber Pine Bench and the Junction with John’s Meadow. Hike #023 on May 3. Day two of backpacking trip. 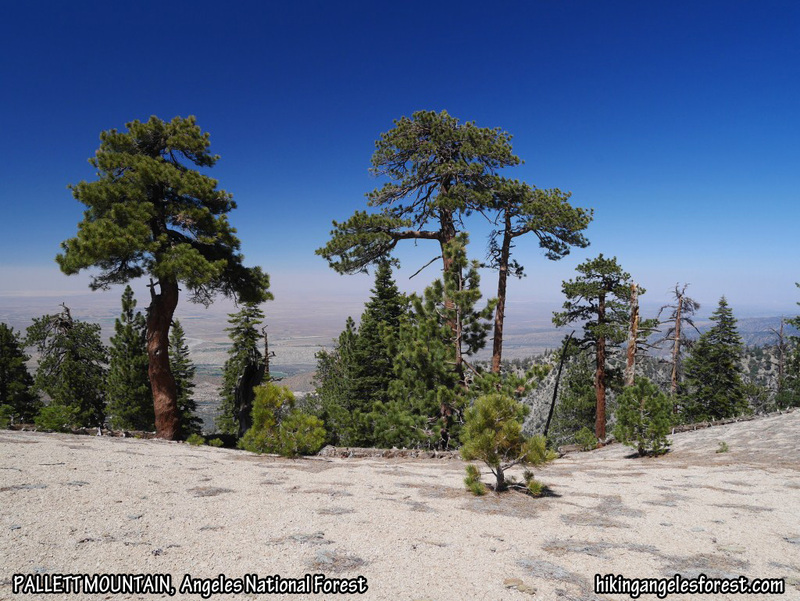 Limber Pine Bench to Angelus Oaks with Scott. Stats: 5.9 miles, 3,400′ loss. 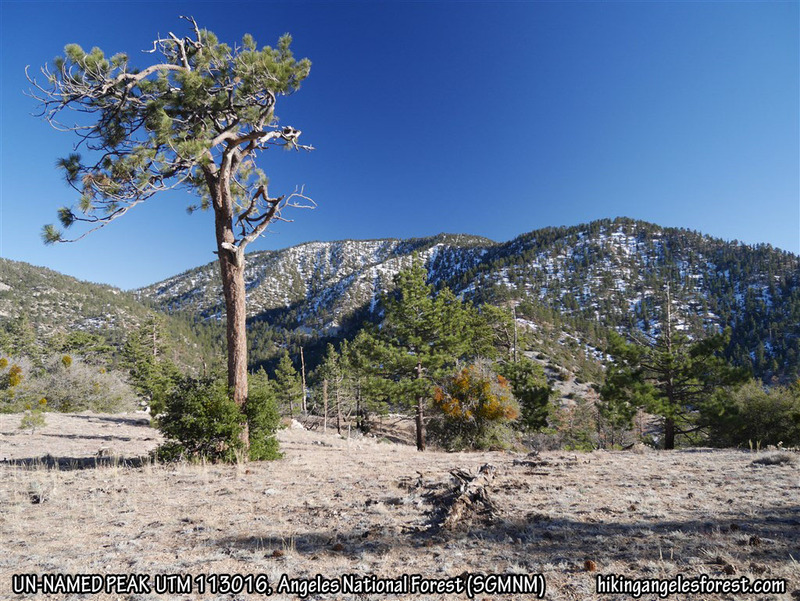 View from Limber Pine Bench toward Mt. Baldy. Hike #022 on May 2. Day one of backpacking trip. 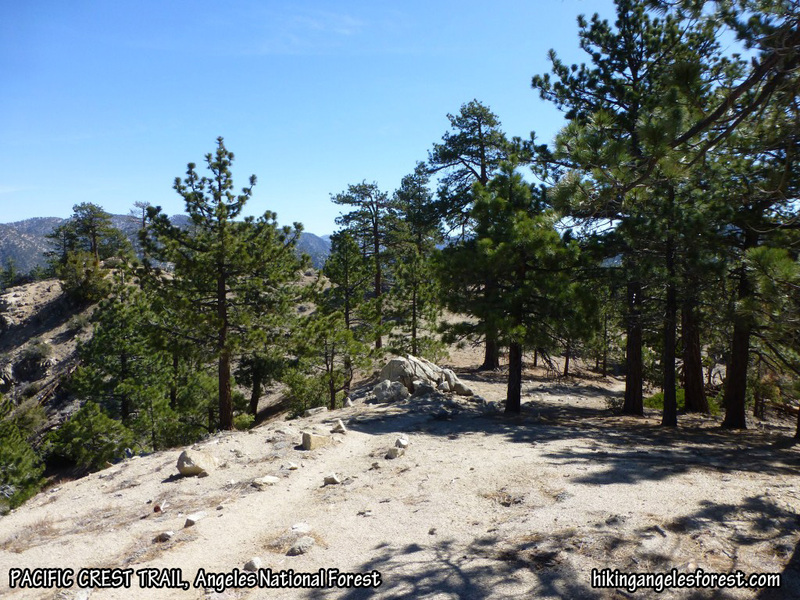 Angelus Oaks to Limber Pine Springs and back down to Limber Pine Bench with Scott. Stats: 6.1 miles, 3,520′ gain, 120′ loss. Mt. Hillyer Trail between Horse Flats and the summit. Hike #021 on April 27. Hike the Silver Moccasin Trail and Mt. 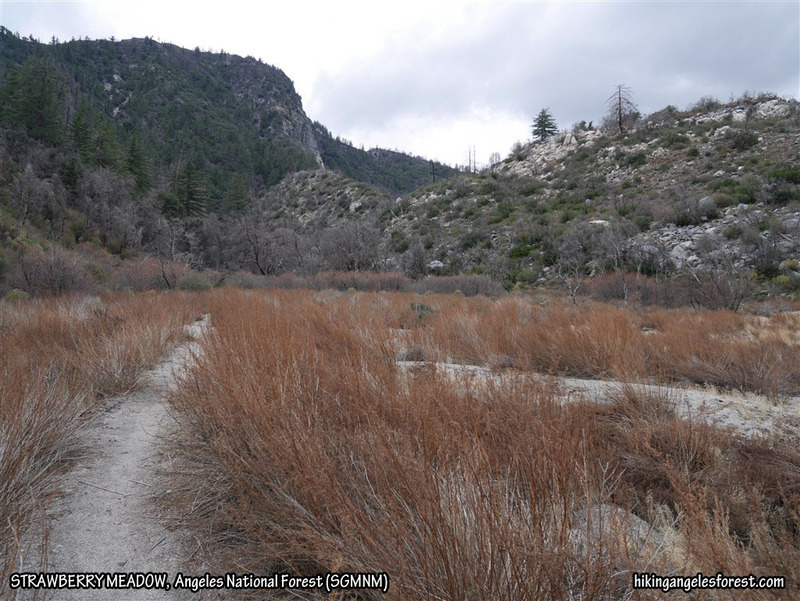 Hillyer Trail from Chilao Flat to Mt. Hillyer with Tim, Jennifer, Dave, and Ian. Stats: 6.2 miles, 944′ gain. 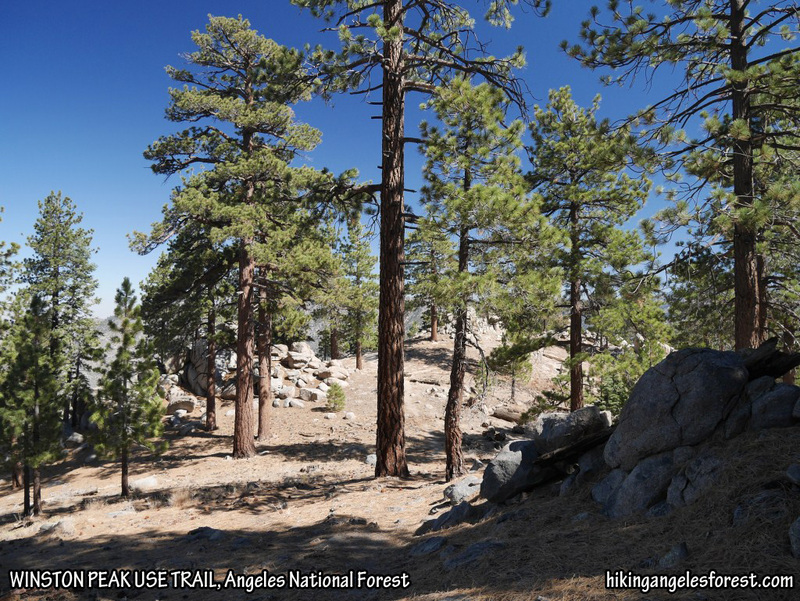 Pacific Crest Trail near Mt. Pacifico. Hike #020 on April 25. 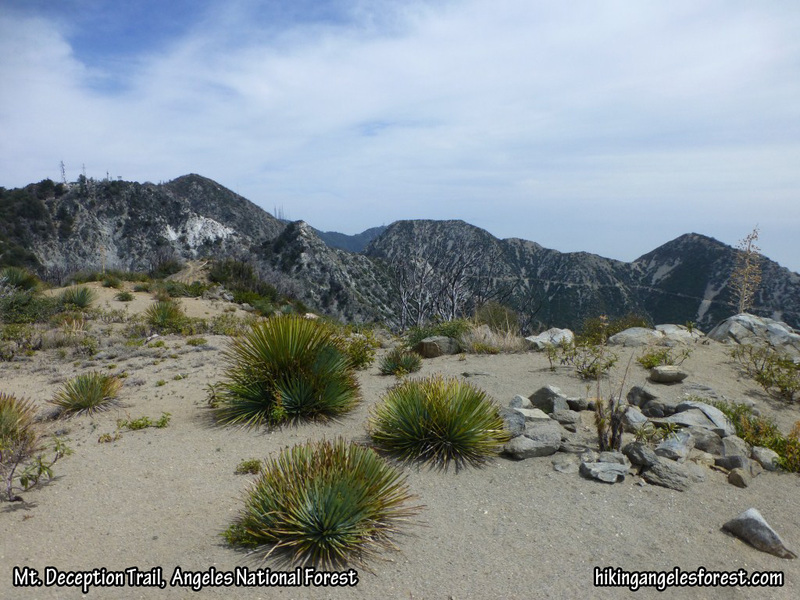 Solo hike of the Pacific Crest Trail from Three Points to Mt. Pacifico. Stats: 21.6 miles, 3,100′ gain. 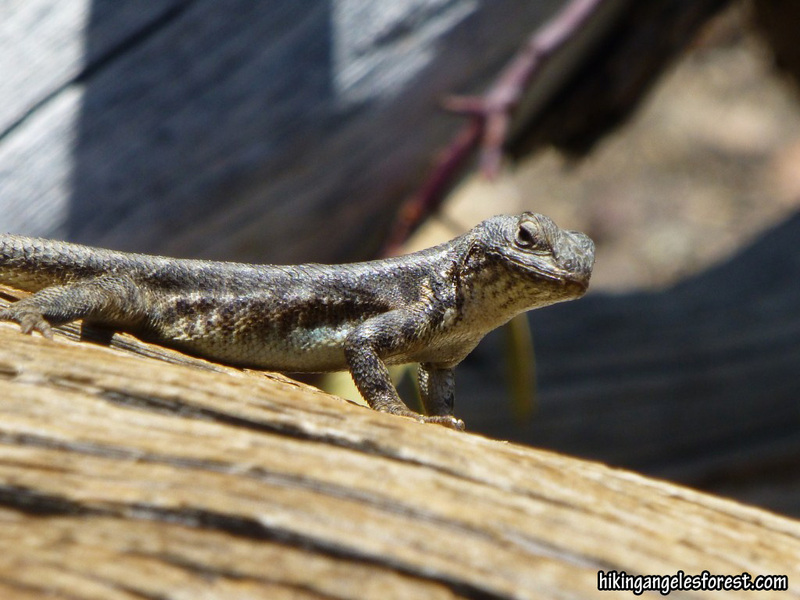 Lizard just after chomping down on an ant at Timber Mountain. Hike #019 on April 20. Solo hike to Timber Mountain going up Icehouse Canyon and down the Chapman Trail. Stats: 10.7 miles, 3,343′ gain. View from the Mt. Deception Trail looking toward Mt. 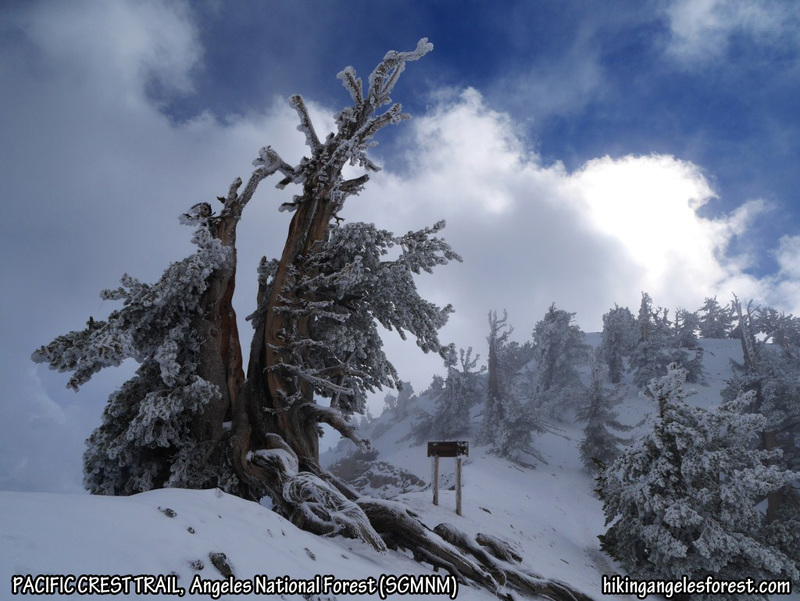 Disappointment, San Gabriel Peak, Mt. Markham and Mt. Lowe (Mt. Wilson and Mt. Harvard in the background). Hike #018 on April 17. Solo hike from the Cobb Estate to Mt. Deception, Mt. Disappointment, and San Gabriel Peak. I went up Castle Canyon and the East Mt. 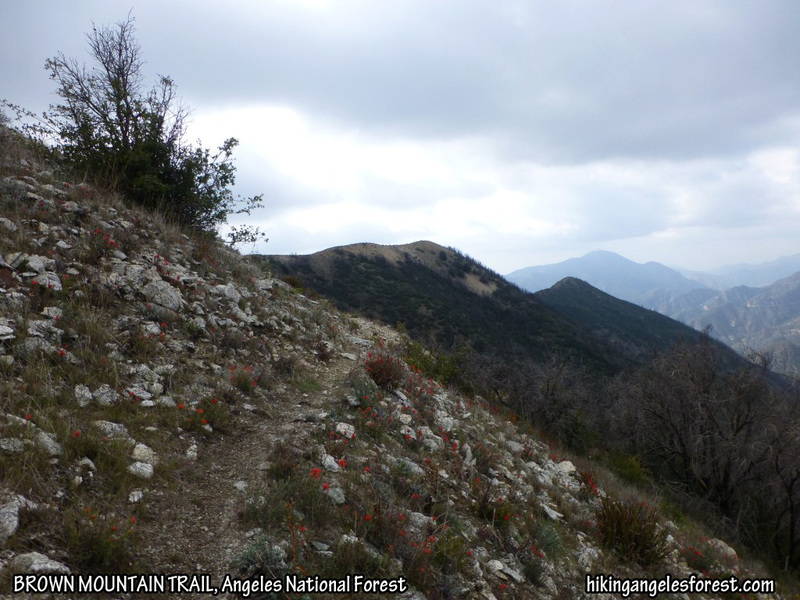 Lowe Trail and took the shortcut down the Lower San Gabriel Peak trail to the road to get to Mt. Disappointment. 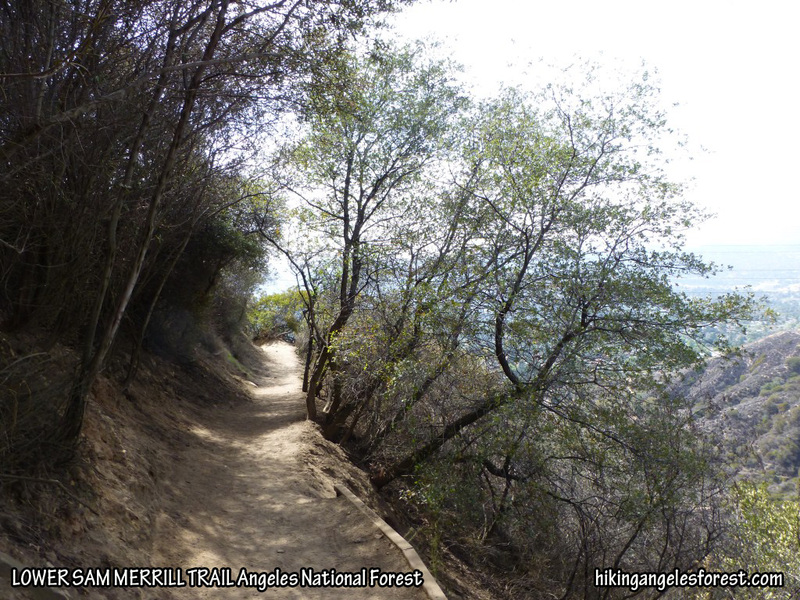 On the way back to the Cobb Estate, I took the Middle Sam Merrill Trail. Stats: 19 miles, 5,425′ gain. 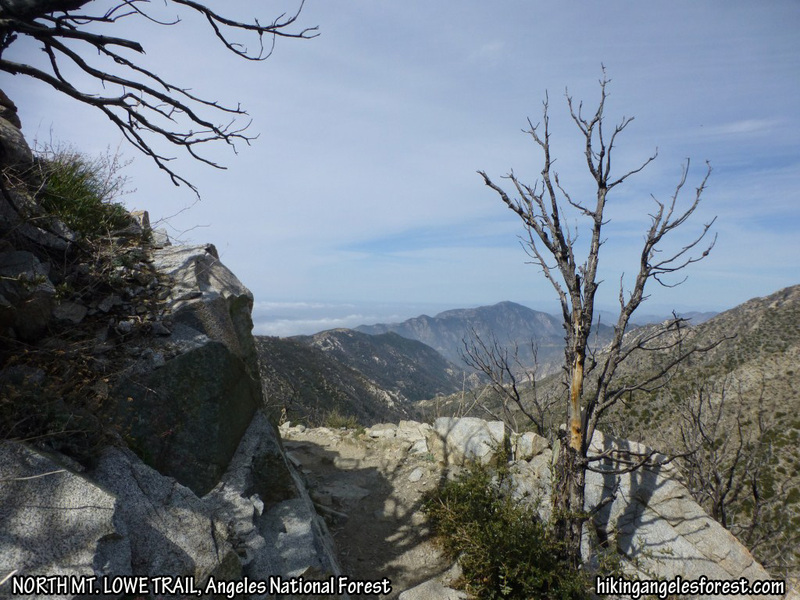 The Dawson Saddle Trail between the Pacific Crest Trail and the Throop Peak Ridge Trail. Hike #017 on April 13. We (Etienne and I) hiked the Dawson Saddle Trail in icy snow the last 1/4 mile (using micro spikes) to the PCT, took the PCT (with a side trip to Mt. Burnham) to Mt. 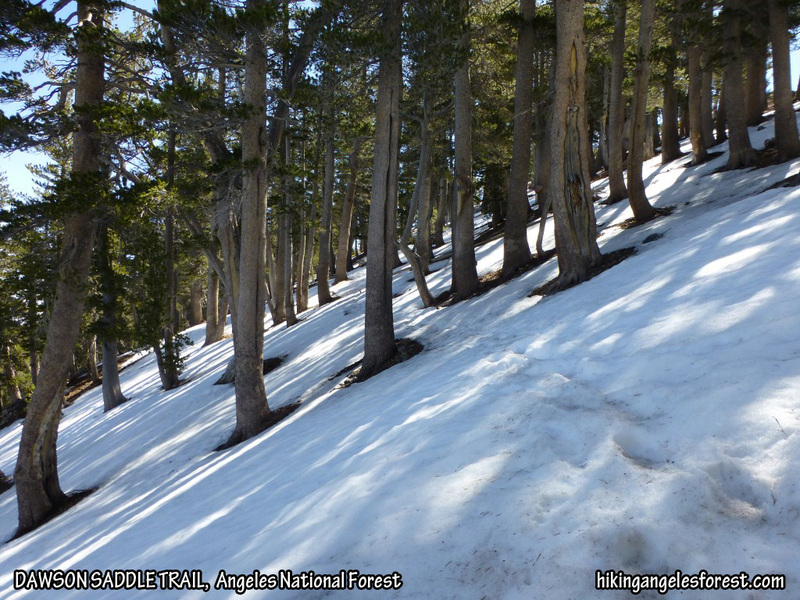 Baden-Powell using the ridge trail at the end to avoid the snow on the PCT. We returned the same way except we went to Throop Peak and down the ridge trail to meet up with the Dawson Saddle Trail to avoid the Icy Snow. Stats: 8.6 miles, 2,778′ gain. 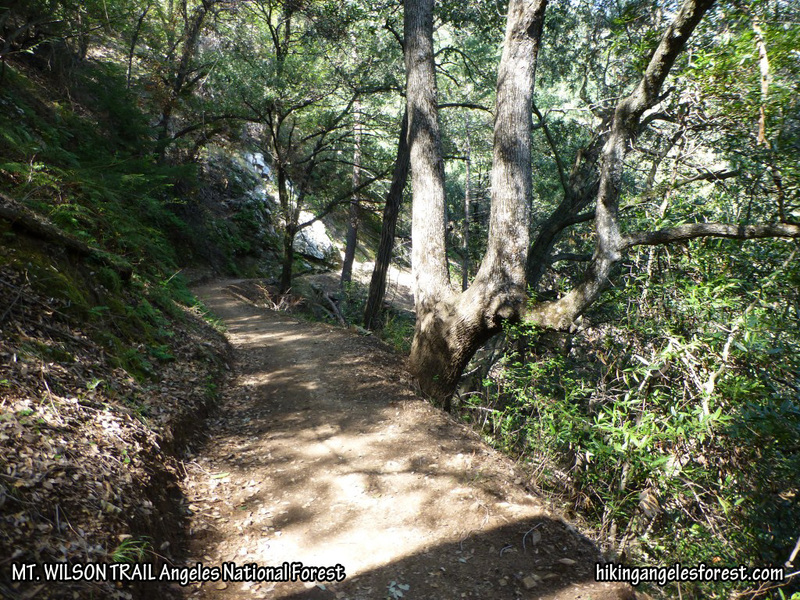 Upper Winter Creek Trail between Manzanita Ridge and JCT to Hoegee’s Campground. Hike #016 on Apr 10. 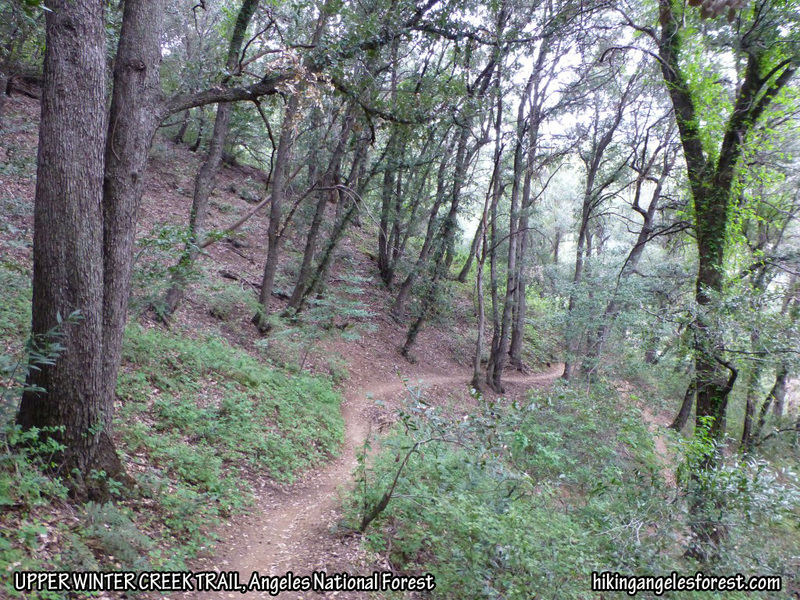 Solo hike from Chantry Flat, up Lower Winter Creek and Lower Mt. Zion Trail to Mt. Zion, down Upper Mt. 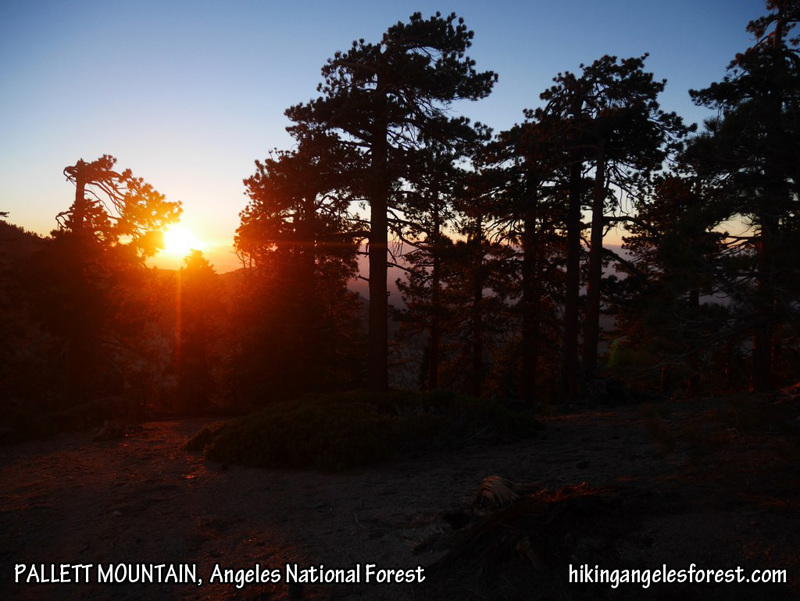 Zion Trail to Sturtevant Camp, Sturtevant Trail to Mt. Wilson, down Upper Winter Creek. Stats: 15.1 miles, 4,445′ gain. Upper Sunset Ridge Trail between Sierra Saddle and Cape of Good Hope. Hike #015 on Apr 6. 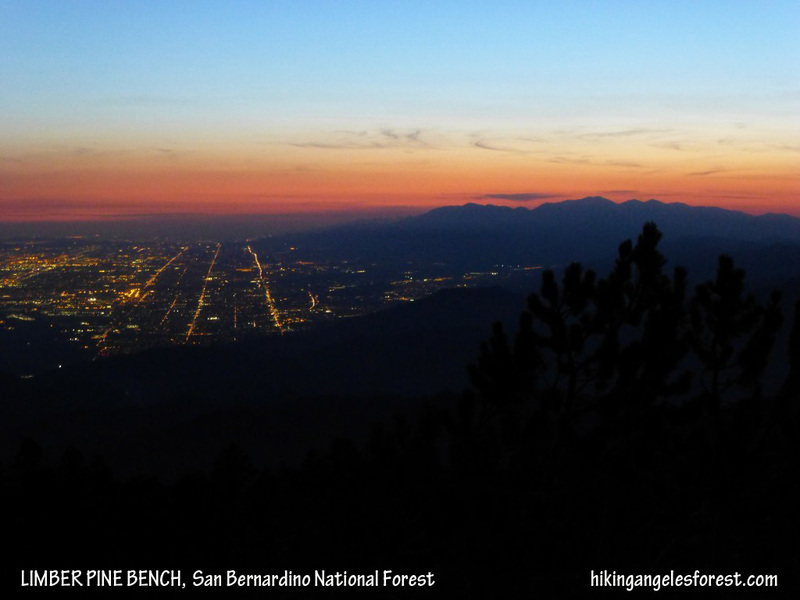 Solo hike of the Sunset Ridge Trail to Echo Mountain. Stats: 8.8 miles, 2,032′ gain. 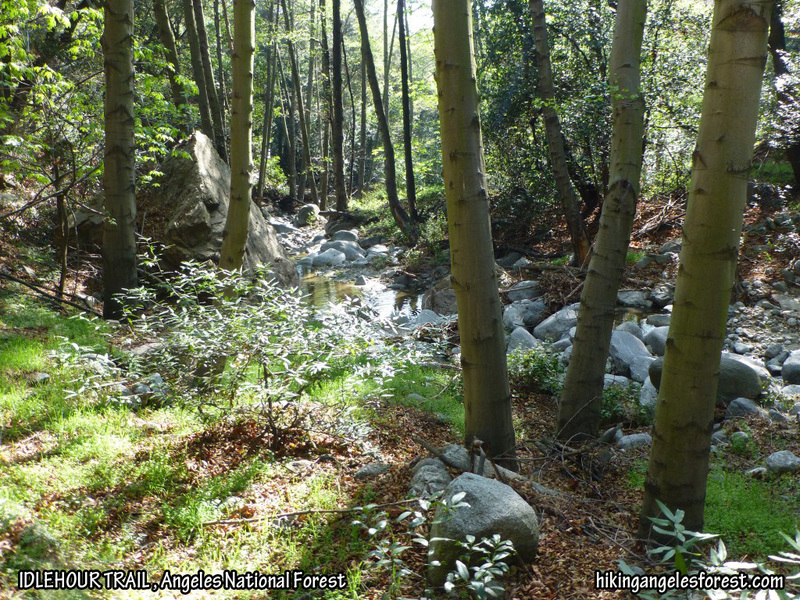 Gabrieleno Trail between West Fork Trail Camp and Devore Trail Camp. Hike #014 on March 30. 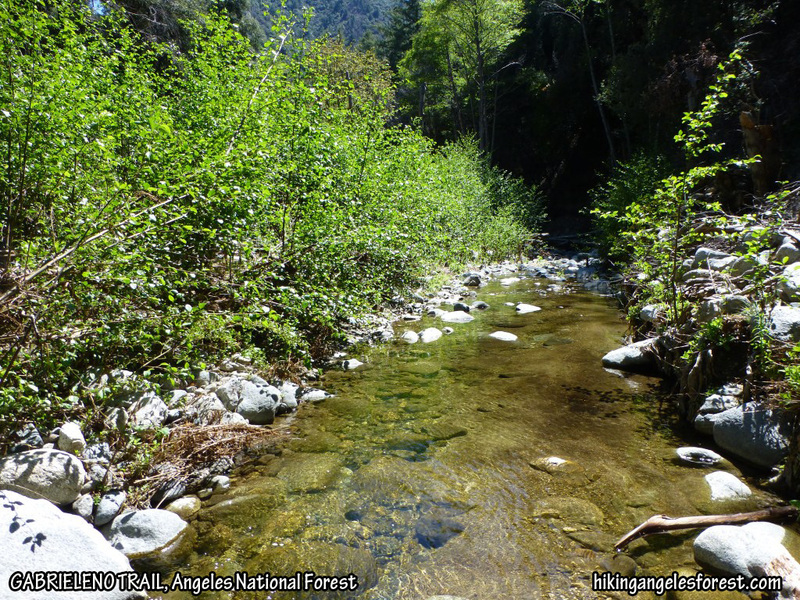 Solo hike of the Silver Moccasin Trail down Shortcut Canyon to West Fork Trail Camp and then the Gabrieleno Trail to Devore Trail Camp. Stats: 8.8 miles, 1890′ gain. View toward Brown Mountain from the East Brown Mountain Use Trail between Tom Sloan Saddle and Brown Mountain. Hike #013 on March 27. Solo hike to Brown Mountain starting from the Cobb Estate and taking the Castle Canyon Trail to Inspiration Point, Mt. Lowe Road the Tom Sloan Saddle Trail down to the saddle and the Brown Mountain Trail (not maintained) to Brown Mountain. 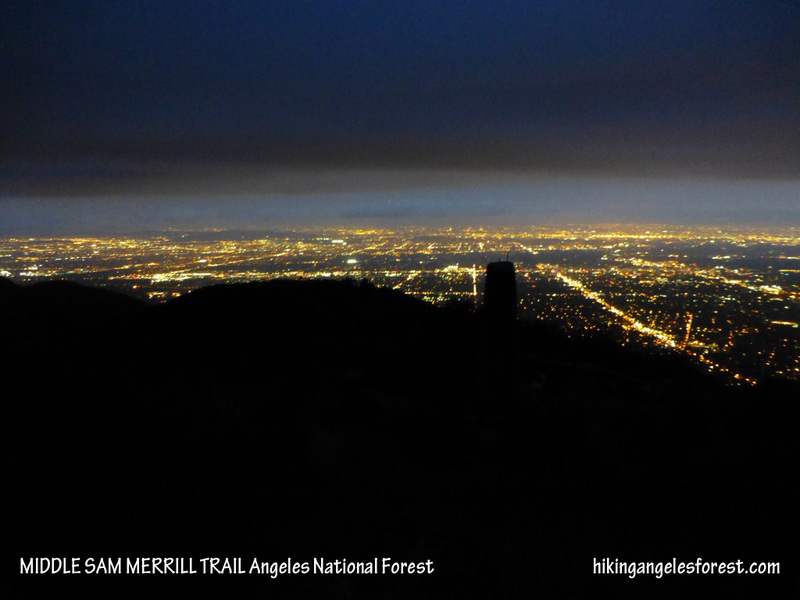 I returned the same way except I took Middle Sam Merrill instead of Castle Canyon down to Echo Mountain. Stats: 17.6 miles, 4,739′ gain. View across Bear Canyon toward Mt. Lukens from the Mt. Lowe Trail. #012 on March 23. Hiked from Eaton Saddle to Mt. Lowe with Sarah, Etienne, Camila, Chloe, Aitana, Olivia, Carla, and Lupita. Stats: 3.2 miles, 520′ gain. 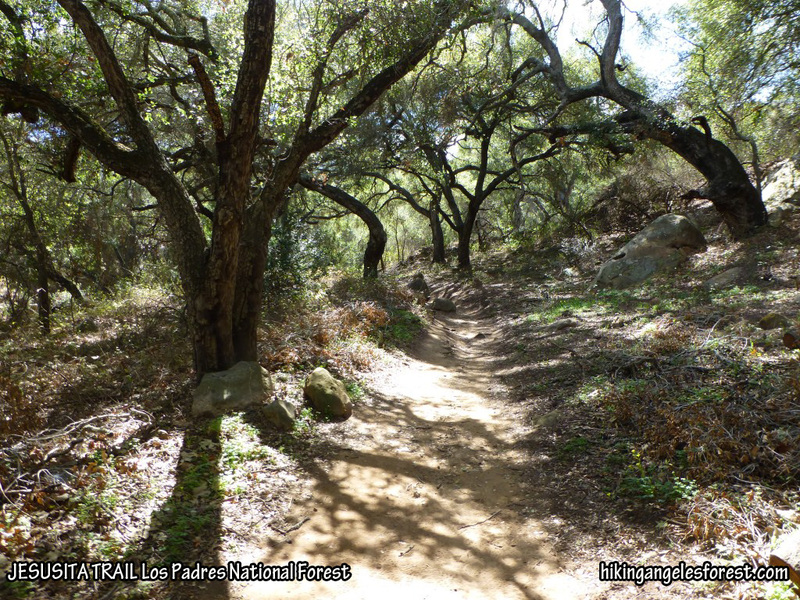 Gabrieleno Trail between Winter Creek Trail and Upper Falls Trail. Hike #011 on March 20. 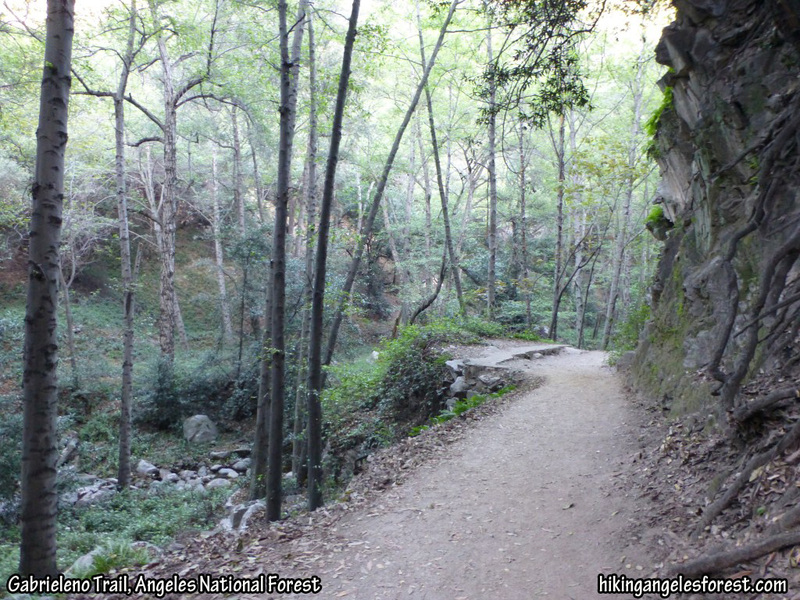 Solo hike starting from Chantry Flat. 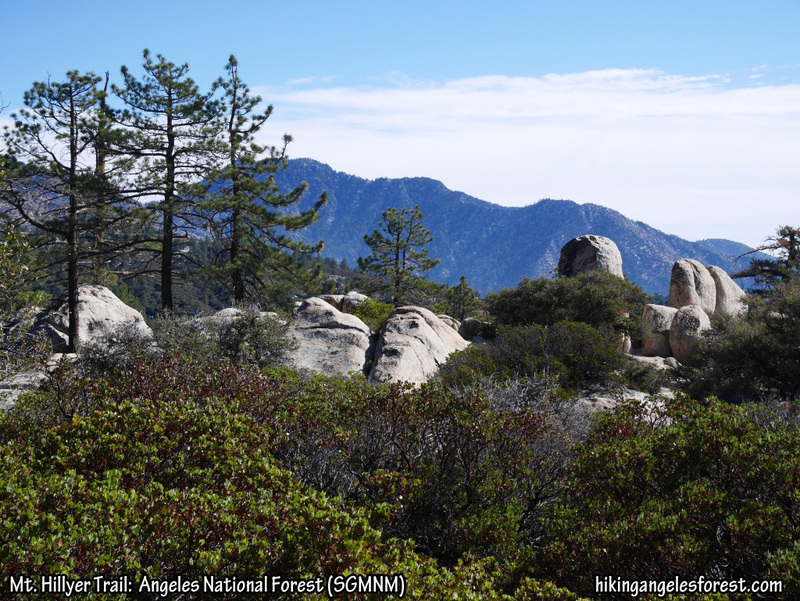 I took the Gabrieleno Trail, Upper Falls Trail, and Sturtevant Trail to Mt. Wilson. 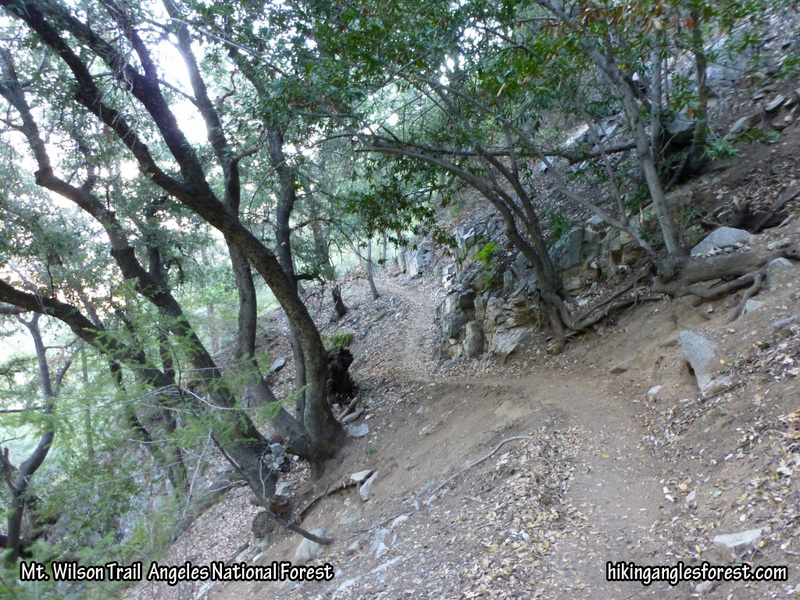 On the way back I went down the Rim Trail to Newcomb Pass and then followed the Gabrieleno Trail back to Chantry Flat. Stats: 17.5 miles, 4,220′ gain. Pacific Crest Trail between Cloudburst Summit and Cooper Canyon Campground. Hike #010 on March 16. 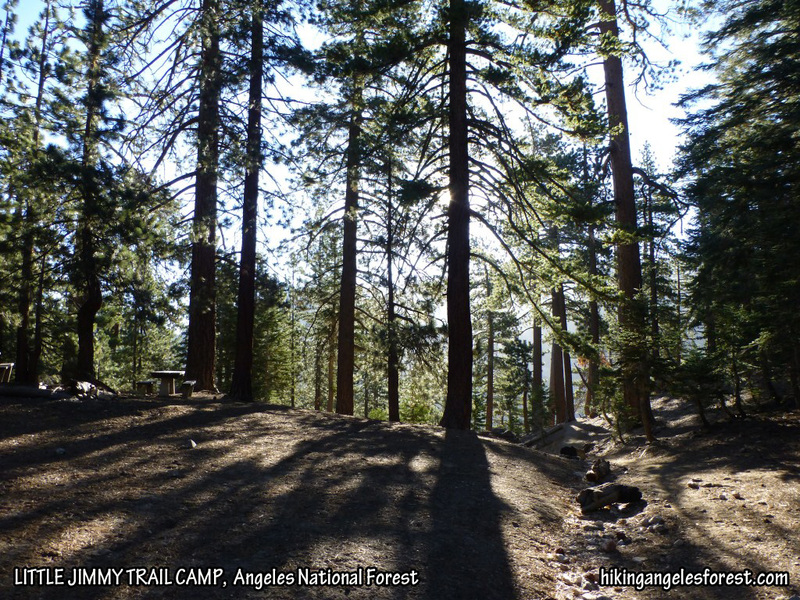 I hiked the Pacific Crest Trail from Cloudburst Summit to Cooper Canyon Campground with Sarah and Etienne. Stats: 5.2 miles, 1,400′ gain. Idlehour Trail between Lowe Saddle and Idlehour Campground. #009 on March 13. Solo hike from the Cobb Estate, up Castle Canyon to Inspiration Point, down the Idlehour Trail to Idlehour Camground, back up to Lowe Saddle, and down the Middle Sam Merrill Trail. Stats: 16.2 miles, 4,849′ gain. Mt. Wilson Trail between First Water and Orchard Camp. #007 on March 6. Solo hike of the Mt. Wilson Trail. Stats: 14 miles, 4,750′ gain. View from the Middle Sam Merrill Trail with Echo Mountain in silhouette. Lower Sam Merrill Trail between the Cobb Estate and Echo Mountain. #005 on Feb 20. Solo hike from the Cobb Estate to Echo Mountain. Hike shortened due to blisters from my new trail runners that I learned the hard way needed to be broken in more. Stats: 5.4 miles, 1,399′ gain. Mt. Wilson Trail between Manzanita Ridge and Orchard Camp. #004 on Feb 4. Solo hike of the Mt. Wilson Trail. Stats: 14 miles, 4750′ gain. 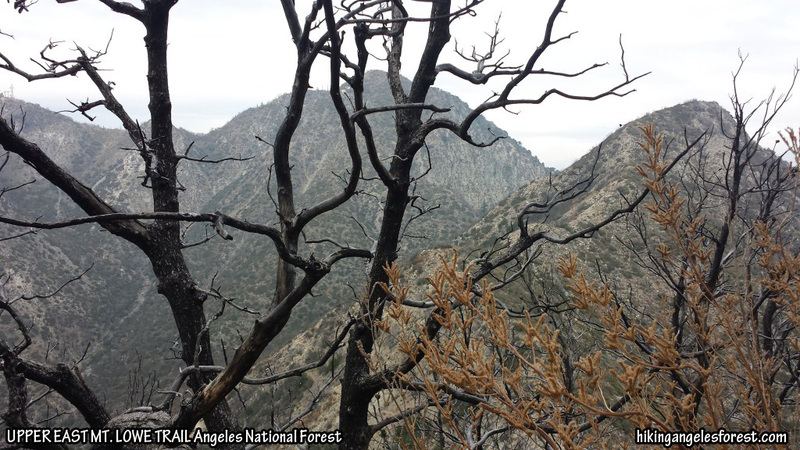 View between Charlton Flats and Angeles Crest Highway. #003 on Feb 9. 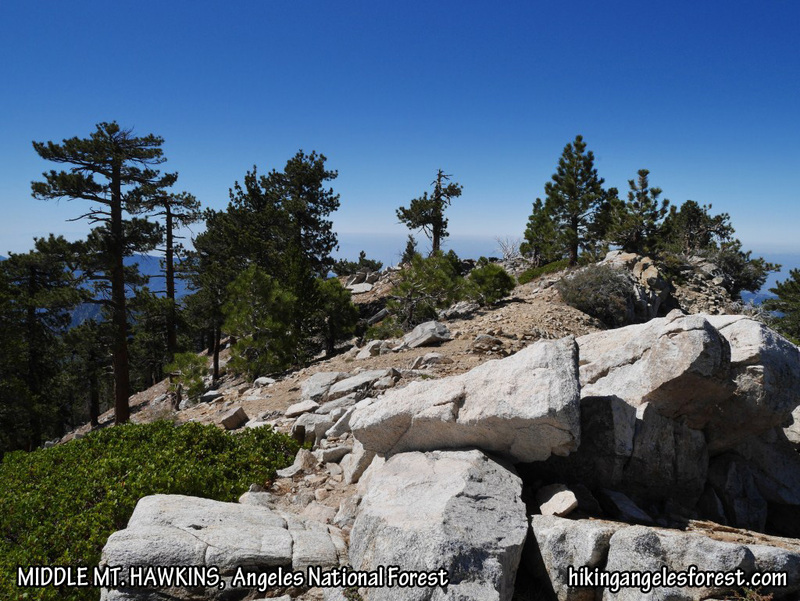 I hiked the Silver Moccasin Trail from Angeles Crest Hwy to Charlton Flats and Vetter Mountain with Etienne, Camila, and Chloe. Stats: 8.4 miles, 2,160′ gain. 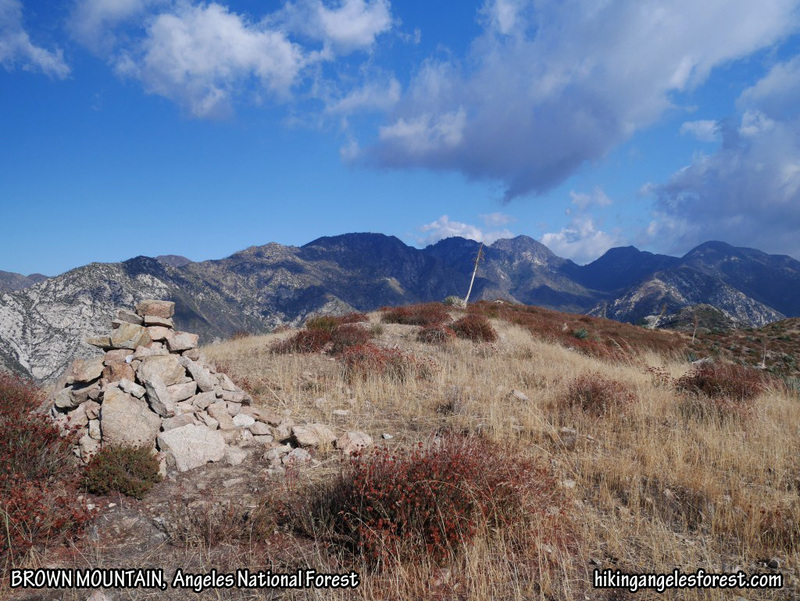 Post: Feeling Better on Vetter Mountain. View toward San Gabriel Peak (center) and Mt. Markham (right). #002 on Jan 26. Solo hike to Mt. Lowe from the Cobb Estate going up Castle Canyon, Inspiration Point, East Mt. Lowe Trail and down Upper Sam Merrill and Middle Sam Merrill. There were some brief periods of sprinkles late in the day and a nice rainbow formed over Mt. Wilson. Stats: 13.5 miles, 3,832′ gain. 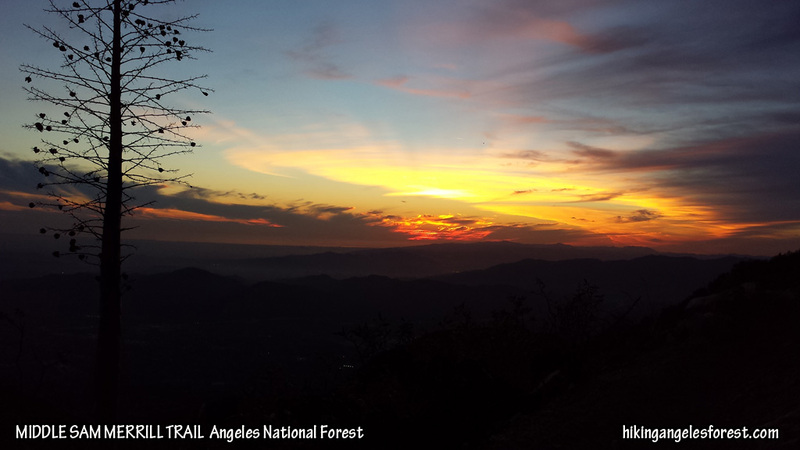 Sunset from the Middle Sam Merrill Trail. #001 on Jan 18. Solo hike to Muir Peak from the Cobb Estate. Stats: 11.6 miles, 2,947′ gain. 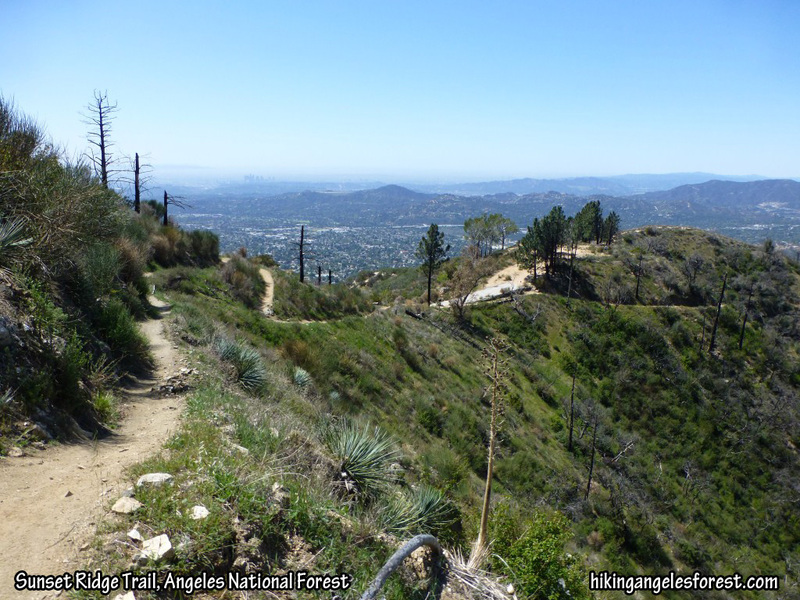 Post: My First Hike of 2014.